Ghost stories are notoriously to get right on stage: the scarcity of genuinely chilling writing is often over-compensated for by productions stuffed with cheap scare tactics and thus it is a genre that I have tended to avoid. 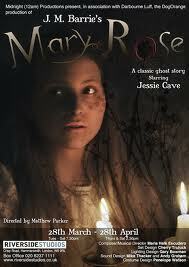 But the prospect of a classic ghost story written in 1920 by JM Barrie (with whom I share a birthday) tempted me sufficiently to book for Mary Rose at the Riverside Studios. And on the surface, it is a conventional ghost story. We open in a creepy and creaky drawing room where a soldier returning to his childhood home from the First World War battlefields find it abandoned and laden with stories of ghosts that haunt its corridors and rooms. Through a series of flashbacks, we discover the tale of the Morland family whose daughter, the titular Mary Rose, disappears on a holiday to a remote Hebridean island only to reemerge some three weeks later as if nothing had happened. Her childlike demeanour persists into married young motherhood, but the lure of the island remains strong and on a return trip, she disappears once more, this time not returning for more than 20 years. But into this story, Barrie interlaces scenes of the Morlands senior, moment of everyday chatter with their friend the vicar, which quietly examine the processing of grief and the loss of a child, an issue that would have been all too painfully real for contemporary audiences as they struggled to comprehend the enormity of the losses of the Great War. Barrie’s protagonist eerily keeps her child-like innocence throughout the play, no matter how much those around her have aged, as if only really living on in their memories. And in his suggestion of a parallel, spiritual realm, he taps into the questions, the hopes of what lies beyond, yet remaining fiercely unsentimental about it. Cherry Truluck’s set plays into this concept perfectly. The walls of the house are made from long strips of something or other which suggests the veil between this world and the next is not as impermeable as all that. Director Matthew Parker has introduced an ensemble of spirits who haunt the every move of this play, whispering, moaning, singing Maria Haik Escudero’s evocative music, and they frequently appear through these walls to startling effect, creating moments of highly atmospheric theatre. It then seems curious that the set should skewed to one side of the studio, the empty space on the right is not really utilised in any meaningful sense, so make sure you don’t sit too far on the right hand side (as you’re looking at the stage). And though the spectral ensemble are a good innovation, the addition of choreography, also by Parker, slows their interventions and thus the play right down. The movement sequences tend to follow the singing rather than accompanying it and so rarely feel like an integral part of the production. But quibbles aside, I found this to be a rather affecting play. Nicholas Hoad and Maggie Robson’s quiet elegance as the parents finding their way through living with such a loss, and the debonair (and most handsomely bearded) Carsten Hayes as husband Simon all impressed with their sensitivity. And if Jessie Cave doesn’t quite tug at the heartstrings enough as Mary Rose, to make us really care about her, she is given little opportunity to as she must remain a woman-child throughout.